I’ve been so excited about this day for ages, learning to make jam is something I’ve always wanted to master but always thought it’d be too scientific and complicated. I’ve grown up watching my mum churn out jars and jars of perfect jams, jellies, chutneys and pickles. She’s even judged them for the legendary WI. She’s a proper expert in all things preserves. I guess I just assumed it was beyond my kitchen know-how. But writing this blog has given me the urge to forge new frontiers beyond the safety of my tried and tested catalogue. 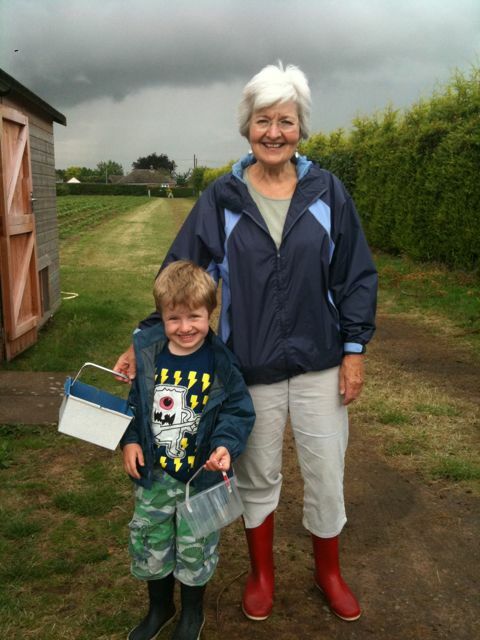 So day one of the school holidays and we’re up in the cooler climate of rural North Shropshire at my mum’s house – aka Granny Strawberry (Sam can’t say Shawbury). 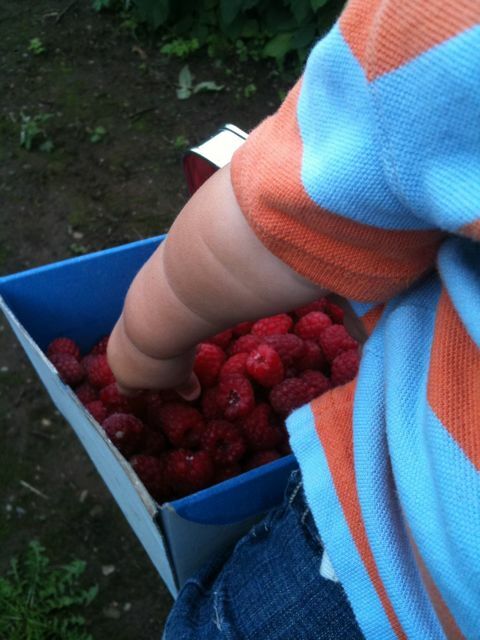 We trooped off to Shawbury Fruit Farm first thing, armed ourselves with punnetts and set about picking as many raspberries as we could before Arlo kicked off or it started raining – Arlo got there first as it happens! 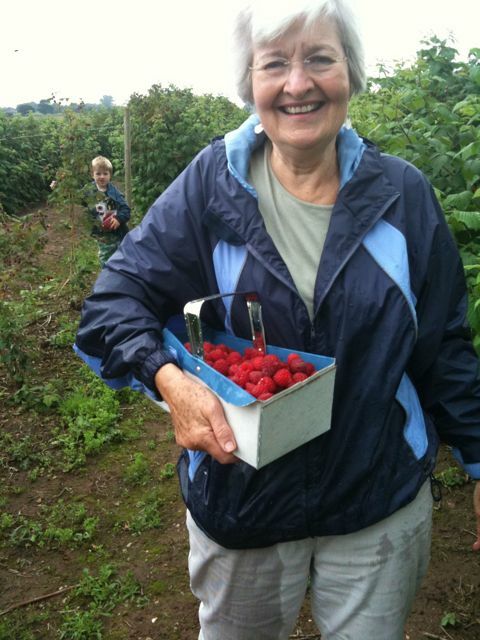 Sam had a blast picking fruit – great holiday activity for kids. He was so proud of his harvest! Arlo enjoyed eating them in his buggy. It’s the best way to get fresh and perfect fruit for your jam making. It’s also extremely satisfying! 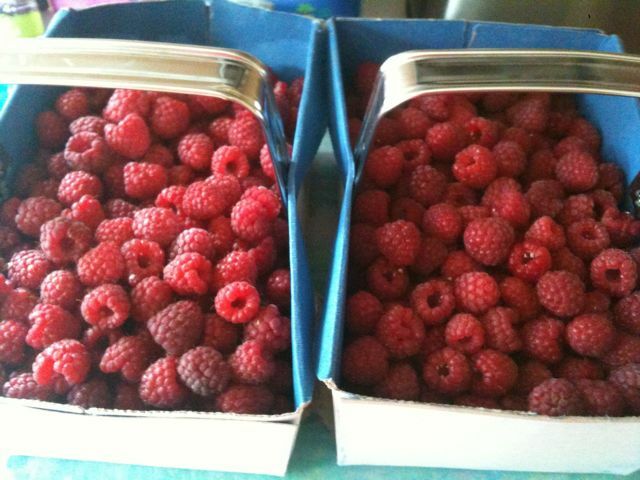 So with over 10 lbs of ruby red raspberries we headed home to make jam. Hurrah! Mum wanted me to learn how to make jam “properly” and without shortcuts so I understand the process. She got all her cool vintage preserve books out and ran through it all with me. 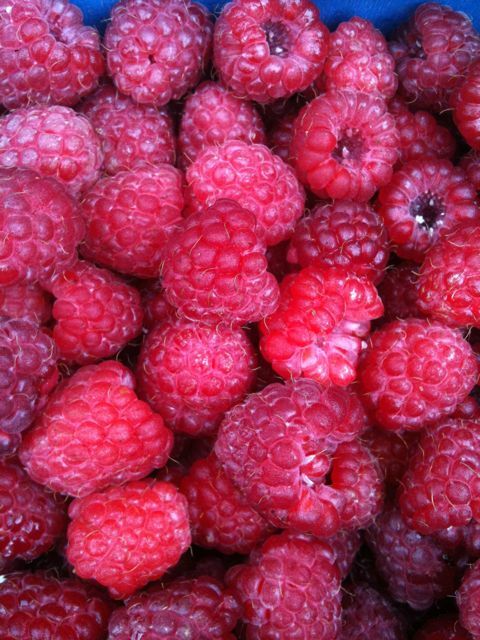 Raspberry jam is a great place to start for a beginner like me. It’s my favourite jam too so brucey bonus! Next up we got out everything we’d need so that we could concentrate on the crucial setting stage once we got there. 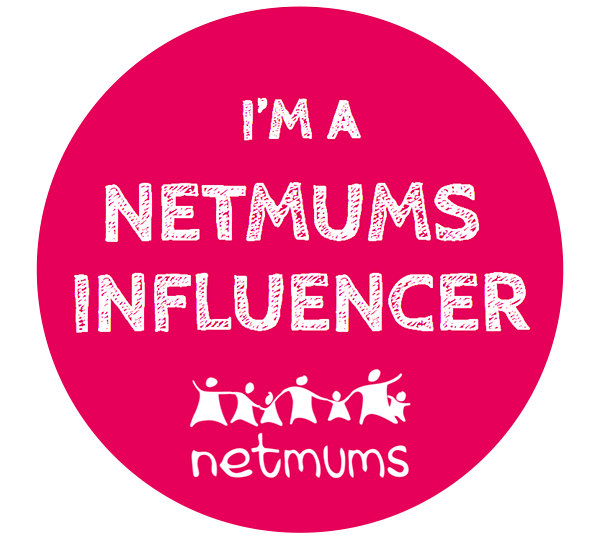 Crikey – this is serious!! 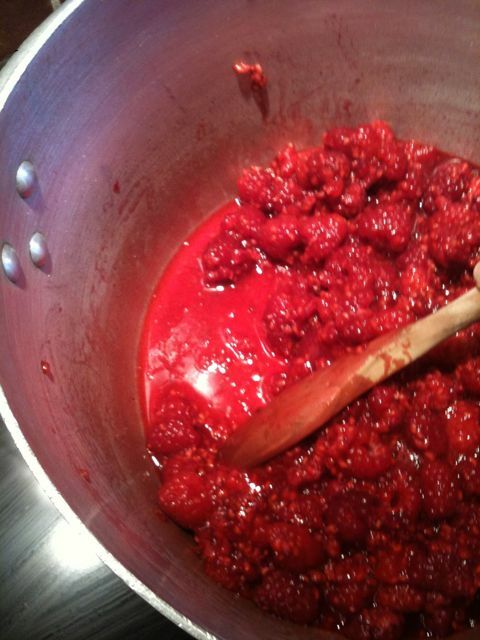 Put your raspberries in the pan over a medium heat, stirring so the juice is released and the fruit gets mushy. Simmer gently. This process is softening the fruit to extract the pectin (setting agent) from the fruit. Once the fruit feels suitably mushed and tender you can do the pectin test to check if enough of the setting agent has been released. into the other. Pour the meths onto the juices, swirl it around for a few seconds and then let it stand for a minute or two. 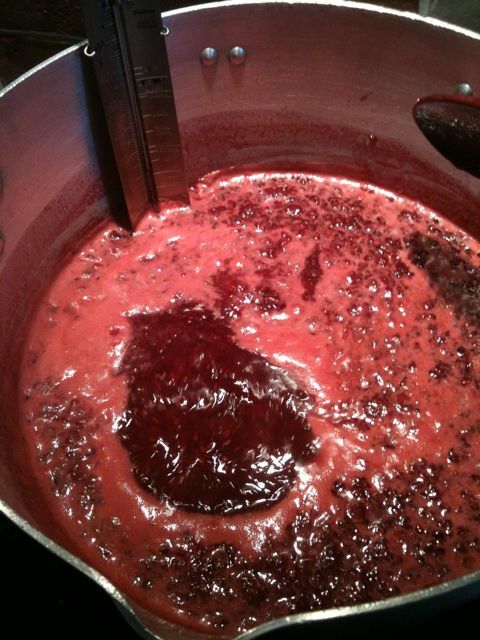 Then pour the meths off into the other jar, and if pectin has been extracted the fruit will form a jelly-like lump. Mine didn’t work first time so I simmered my fruit for a bit longer and then did the test again. It worked beautifully second time around and demonstrated exactly why this test helps make a better jam. So with the pectin extracted it’s time to move on. Heat up the sugar in the microwave on full power for two minutes. Put your freshly washed jam jars in the oven at 50C. 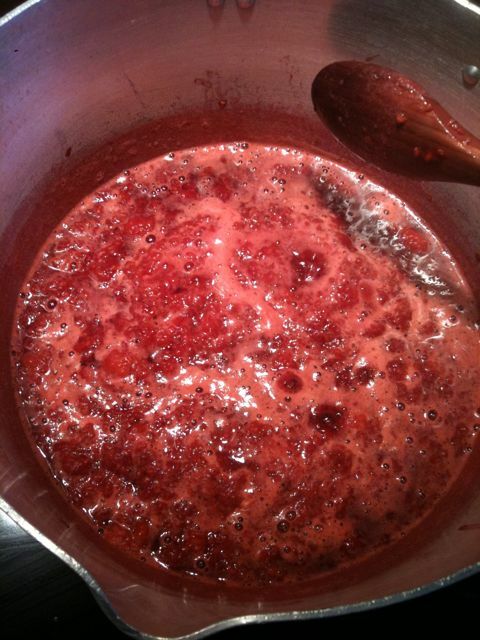 Take jam off heat and stir in your warmed sugar until it’s dissolved. Put thermometer in, turn up the heat and boil rapidly until setting point is reached. Temperature wise this is 220F on my mum’s thermo and there’s a fierce rolling boil going down in the pan. The colour of the liquid has deepened from a bright scarlet to a deep ruby red. So now it’s time to check if it’s going to set. First do the Flake test. 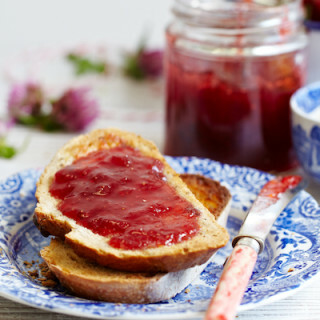 Dip a wooden spoon in the jam and remove it holding it above the pan, twirl the spoon a few times to cool the jam. Let the jam fall off the spoon. 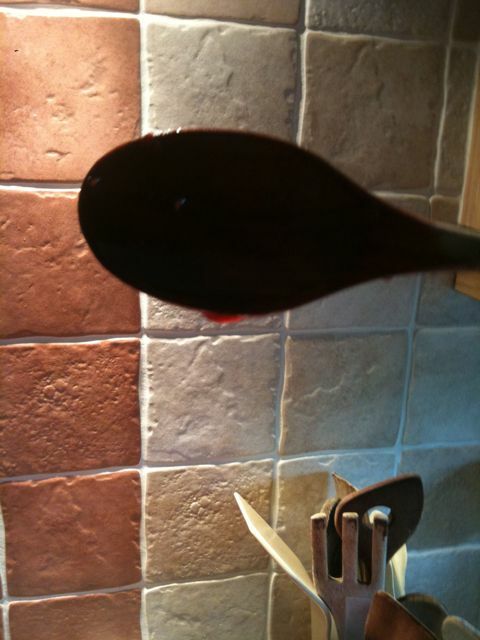 If the drips run together and form flakes that ‘hang’ on the edge of the spoon, a setting point has been achieved. 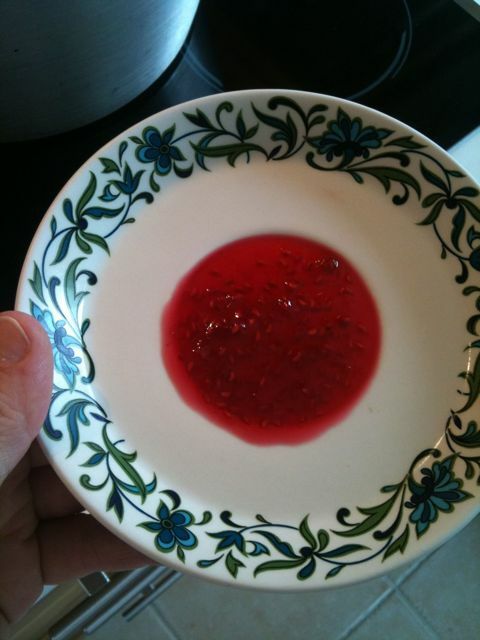 To confirm this do the cold saucer test Get your saucer and spoon out of the fridge, put a bit of your jam on the dish and whack it back in the fridge for a minute or two. While you’re waiting spoon off any scum that may have formed on the surface into a little dish. I don’t think it should be called scum as it’s so delicious. Maybe jam froth would be more attractive? Whatever you call it, keep it coz it’s lovely! So get your saucer back out of the fridge and draw your finger across the surface. If it’s startingto set a thin film should be forming and will crease as your finger goes over it. If it doesn’t then boil it a bit longer and try the test again. 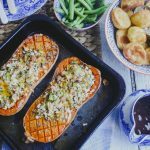 Once you’re happy with your set, remove the jars from the oven onto a heat-proof surface. 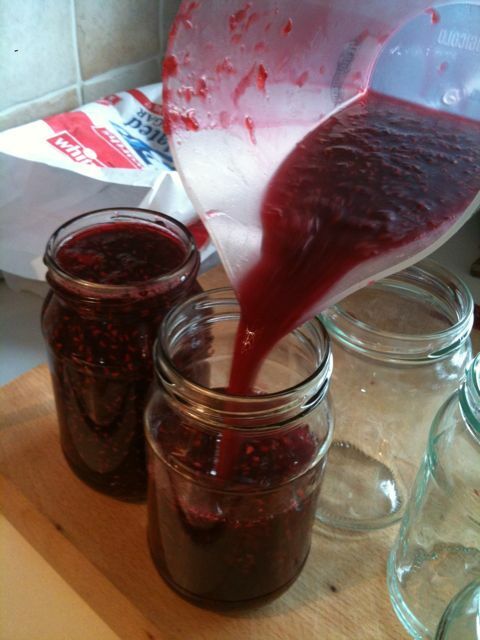 In batches pour your jam into a jug and then pour carefully into your jars about 1cm below the rim of the jar. The jam will shrink when it cools. Wipe clean the tops of the jars and remove any more froth that may have formed. Then tightly screw on the lids. Allow to cool and then label. The kitchen smelt intoxicating throughout the jam making. I felt like I was at hogwarts in a potions class and especially enjoyed the sciencey experiment bits. 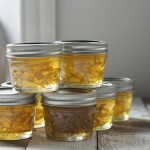 I’m grateful to have learned from someone with so much experience of preserves. I feel like it’s given me a good grounding and that I can go off and experiment a bit. Above all I’m chuffed to bits with the beautiful jars of Shropshire raspberry jam i’ll be taking back to London -Thanks mum! Wow! 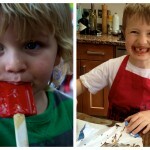 You are so lucky to have your mum show you how to do this! I’m a bit nervous what to do with the meths though?! My mum is a legend. Jam making seemed like a truly frightening prospect before she showed me how to do all the sciencey bits. The meths bit is v simple. We should do a jam sesh together – Jamming! Thanks!!! I really enjoyed the whole experience and feel ready to try different flavours… Been to Lakeland this morning to get a thermometer and jelly bag!!! 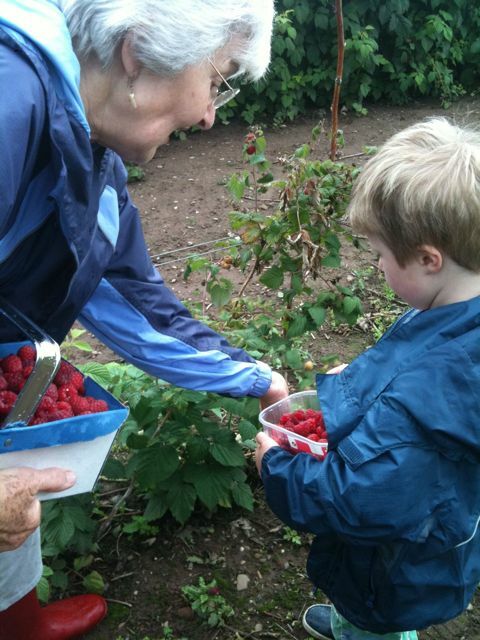 ‘Pick your own’ is a great (and cheap) form of school holiday entertainment… Jam is fun – honest guv!!!! Methinks I need to get out to my nearest ‘pick your own’ and try something new. Thanks for explaining all the complicated bits and for the lovely pictures. My pleasure darlink… Get your jam pan oot pet! I was very thrilled to be able to share my jam making skills with you and hope it will encourage others to have a go,it is a very rewarding exercise. I used to buy my meths from a local hardware shop (sadly now closed) and the owner always teased me about the purchase, but then remarked that he knew it was for some other use! Thanks mum!!!! You are a jam legend!!!!! Thanks Tara! 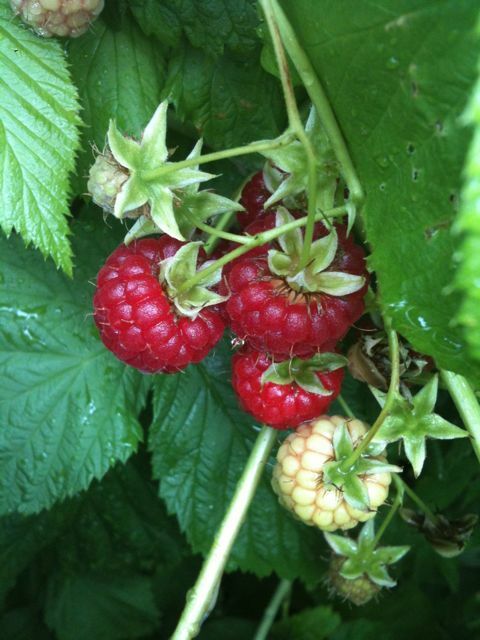 I’m defo going to get some bramble jelly on the go – i’ve bought a jelly bag and found a bounty of fruit at a local nature reserve – bonus!!!!! I got into jam making just last year, very satisfying! I have never heard of the meths test before though… do you need to do ALL the various tests for set? I need to find out more about the meths one though! My mum always does the meths test – being a home economist and women’s institute member you can always count on her to do things thoroughly!!! You don’t need to do all the setting point tests – mum just wanted to show me them all. LOVE this post and that all the WI teach the same way. The meths bit went a bit over my head in my master class. How did it taste? Are you going to enter any of the jars? 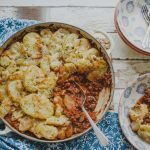 The WI are such experts – I feel really lucky to have my mum as my cooking tutor!!! 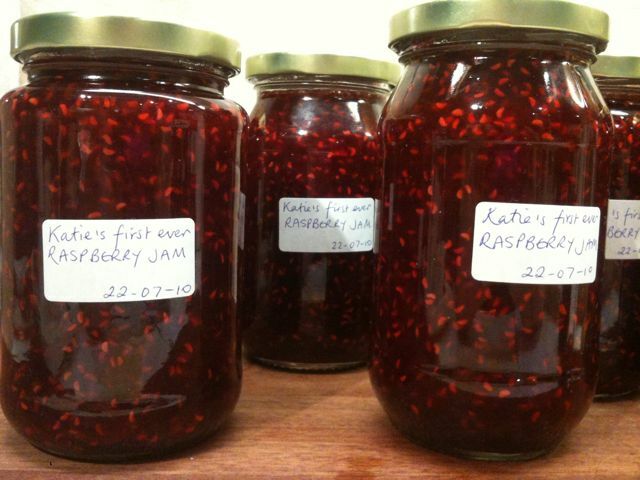 The jam tasted wonderful – I only have one jar left and am saving it for a special occasion. I would def have entered it for something but I’m not sure they do village shows in Ealing 🙁 how was your jam? I have just stumbled upon your post whilst trying to learn about jam making myself. I am very confused at the moment about how to make sure that my jars are sealed properly. You didn’t process them in a water bath or anything, did they still seal and keep properly? 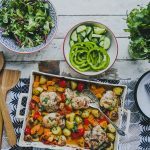 Hi Karina, and thanks for checking out my post. 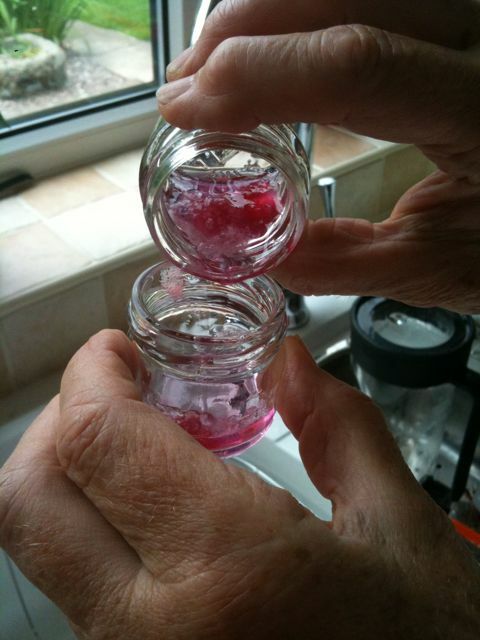 I always sterilise my jars and use brand new screw top lids. You simply need to screw them tightly shut to create the seal. My jams keep well for at least 12 months. This is the British approach to making jam, I think the American canning method is different and involves the water bath you refer to. 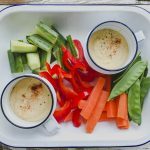 There’s a blog called Food In Jars that could be helpful if you’re taking that approach. But do try the UK technique and see how it works for you.